+ATK: With a solid base Attack stat of 34, New Year Takumi benefits greatly from an Attack boon, which offers him a solid boost to his overall raw damage output. +SPD: A Speed boon gives New Year Takumi more options offensively and defensively, making it a fantastic choice for a boon regardless of the build he is running. +RES: In addition to increasing his likelihood of activating Ploys, a Resistance boon also gives New Year Takumi the ability to specialize further as a mage killer. HP: In order to preserve his magical bulk, his HP stat is generally best left at neutral. However, if using skills that require New Year Takumi to reach an HP threshold such as Desperation, a bane in this stat can be taken. -DEF: New Year Takumi’s ideal bane, as this is his most disposable stat and dumping it further has no effect on his already poor matchups against opponents who target his Defense. This build is meant to capitalize on New Year Takumi’s fantastic offensive spread, allowing him to become a powerful presence in the Player Phase through frequent Special activations. A Speed boon is ideal in order to increase his likelihood of performing follow-up attacks and charge up his Special faster, although an Attack boon can be taken to strengthen his overall raw damage output. Regardless of the boon chosen, however, New Year Takumi benefits immensely from support/buffs to both of these stats. Specials like Moonbow and Glimmer work exceptionally well with this build as their relatively low cooldown allow him to activate them regularly, though their effectiveness varies depending on who he is facing. Moonbow will generally prove to be the most useful, helping him against high Defense opponents who he would otherwise barely dent, but Glimmer can also find its uses against opponents with high HP. Lethal Carrot complements this build’s offensive playstyle perfectly and grants New Year Takumi a flat +10 damage whenever his Special activates. When combined with the Flashing Blade seal, he will be able to consistently activate his Special, even while under Desperation's HP threshold. Alternatively, one can use his native Kagami Mochi, foregoing raw power in exchange for more consistency. Nevertheless, a Speed refine on either weapon is recommended to enhance his ability to perform follow-up attacks. Atk/Spd Solo is his best choice for an A slot, granting him an impressive boost to his offenses and allowing him to preserve his decent Resistance stat while having a relatively easy-to-meet position requirement. Alternatively, one can take Swift Sparrow as his chosen A slot skill should Atk/Spd Solo be unavailable to grant him a similar, albeit lesser, increase to his offenses. On top of bolstering his offensive presence, Fury also increases New Year Takumi’s physical bulk as well as his probability of activating Ploys against his opponent, making it a fantastic alternative on a budget. As for his C slot, Def Ploy helps increase the overall strength of his attacks while Spd Ploy helps further build upon his ability to double his opponent. Aside from Ploys, he can also run a Hone/Spur of one’s choosing that helps fill his team’s needs. Aside from the Flashing Blade seal, the Quickened Pulse seal can be an extremely potent option when used alongside Kagami Mochi to have Moonbow/Glimmer immediately charged, giving him the potential of activating it twice in a single combat. If it is not available, the Speed +3 Seal is also a solid alternative. This build aims to capitalize on New Year Takumi’s good magical bulk and great Speed stat to turn him into an effective mage killer. An Attack boon is a fantastic choice and helps maximize his OHKO potential while a Speed boon lets him naturally avoid follow-up attacks from speedy mages; a Resistance boon can also be used to improve his magical bulk. His weapon of choice for this build is the Kitty Paddle, granting him a 50% Attack increase when fighting mages. With this tremendous boost to his damage output, New Year Takumi is able to effectively handle and OHKO all but the tankiest of mages, with the most notable example being Winter Tharja. On a budget, his native Kagami Mochi also works and gives him faster Special cooldown; if opting to use Kagami Mochi over the Kitty Paddle then a Speed boon coupled with a Speed refine is ideal, as he will now lack the power to OHKO many mages and will rely on his ability to avoid follow-up attacks for survivability. Glimmer scales extremely well with Kitty Paddle’s effective damage, making it his best choice for a Special. However, if wanting more consistent damage output increase, Iceberg is a solid alternative. Iceberg is particularly lethal if using Kagami Mochi, as the weapon makes it have a two-turn cooldown meaning that it will activate in each combat where New Year Takumi can counterattack twice. Moving on to choice of main skills, his native Atk/Res Bond works wonderfully for this build, giving him a considerable +5 increase to two of his most important stats at the cost of having a singular ally be adjacent to him. His B slot for this build is mostly up to personal preference, with some options including Guard, Cancel Affinity, and Quick Riposte. Guard lets him safely bait mages who rely on quick Special activations to do large amounts of damage while Cancel Affinity lets him take on TA Raven mages. Alternatively, Quick Riposte offers him more overall coverage across his matchups and guarantees him a double on the Enemy Phase, regardless of his own Speed; this is extremely beneficial to him as any kind of Speed stacking with this build is meant to help New Year Takumi prevent follow-up attacks rather than perform them. For his C slot, Atk Smoke grants him greater survivability in the Enemy Phase when tanking more than one mage and the debuff can be used to his team’s advantage as well. With his decent Resistance stat, he can also make rather frequent use of Def Ploy to help boost his damage output. Otherwise, any support skill that benefits his team can be used here. Using Distant Def in his Seal slot helps boost his survivability in the Enemy Phase but if it is unavailable, either the Attack +3 or Speed +3 Seals make for solid replacements. 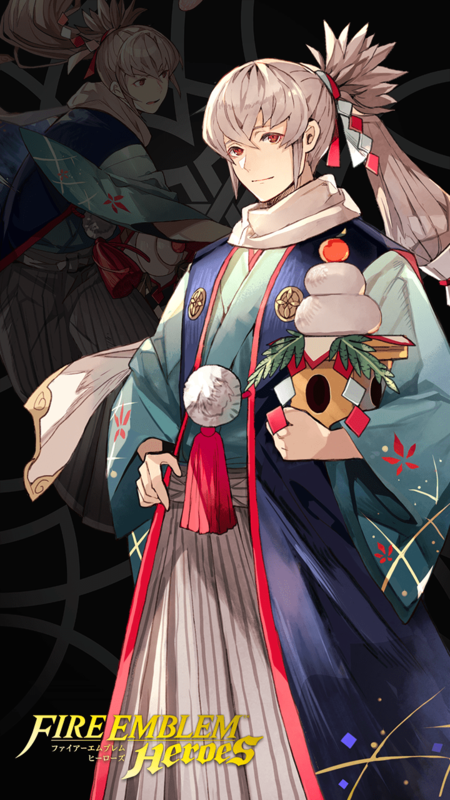 Bearing traditional Hoshidan clothing and an impressive offensive stat spread of 34/34, New Year Takumi distinguishes himself as one of the stronger dagger units released, who also possesses a great weapon in the form of the Kagami Mochi. Arguably one of its best users, it allows him to easily inflict large amounts of damage on his opponent with frequent Special activations. New Year Takumi also has a great magical bulk of 67, which when combined with his offensive spread, makes him a deadly threat to most mages. However, his stat spread’s strong focus on his offenses and Resistance leaves him extremely fragile to most forms of physical damage in addition to dragons, who will always target his pitiful Defense stat due to their ability to deal adaptive damage against ranged. Also, his limited availability makes him an overall less worthwhile investment in comparison to other strong dagger units who are readily available like Sothe. Regardless, New Year Takumi is still an incredibly powerful unit and is a perfect fit for any team compositions looking for a potent offensive unit or an efficient mage killer. At a neutral offensive spread of 34/34, New Year Takumi is one of the more offensively oriented dagger units around. His strong offenses also grant him some flexibility in the kinds of builds he can run, allowing him to fit into a variety of team compositions. In addition to giving him the ability to activate Ploys fairly often, his decent Resistance stat combined with his offenses allows him to fit the role of that of a formidable mage killer. New Year Takumi’s base Defense of 17 does him no favors, making him incredibly weak to most forms of physical damage and dragons. Initiating against such opponents is incredibly risky, and should he be unable to ORKO them, it is likely that he will die on the counter. His status as a seasonal unit makes acquiring merges and finding the right IV set for him a frustrating task, and with other powerful and more available dagger units such as Sothe and Kagero available in the regular pool, investing in New Year Takumi may not be worthwhile in the long run. Buffers: Units such as Marth, Sanaki, Bridal Ninian, Ephraim, and Eirika who can provide him with buffs to his offensive stats help improve his overall performance tremendously. Refreshers: Particularly when using purely offensive builds, refreshers like Ninian, Lene, Azura, and Olivia can help dramatically improve New Year Takumi’s offensive prowess, giving him the ability to shred through multiple opponents in one sitting and can also help get him out of tough binds. High Defense Tanks: High Defense tanks who also boast low Resistance make for a perfect ally for New Year Takumi, as they can cover his weakness to strong physical hitters. In addition, such allies benefit from his ability to swiftly deal with mages. Several notable examples of such units include Arden, Chrom, Draug, Lukas, and Shiro. Archers: Offensive archers such as Innes, Takumi, Brave Lyn, Bridal Cordelia, and Roy (LA) can easily tear through the pineapple’s low Defense and land the ORKO. Strong Physical Hitters: Strong physical hitters such as Hector (LA), Effie, Cherche, Soleil, and Winter Chrom are also able to similarly make quick work of New Year Takumi. Dragons: Refined dragonstones have the ability to target the lower of a ranged opponent’s defenses, and with New Year Takumi’s lopsided defensive spread, dragonstone users such as Kana (F), Nowi, Corrin (F), and Adult Tiki are effective counters as well. Raven Tomes: Wielders of the TA + Raven tome combination are hard counters to colorless units with Takumi being no different. Even with his above-average magical bulk, units such as Lyon, Robin (M), and Spring Camilla will have no issue in decimating him. Fury helps boost all of his stats (especially his horrible Def), while also helping him get into Desperation range quickly. While weakening his enemies through his weapon's effect, he is also boosting his teammates with Hone Spd. The most fun NYakumi build so far for me. This build smokes (im f*cking hilarious) the entire enemy team, assuming that they are in close proximity. Since Kagami Mochi has the Res and Def Smoke built into the weapon, and Atk and Speed smoke added on also will be quite an annoying thing to deal with. Windsweep ensures that Takumi will not be taking any damage from decent speed distant counter units. So, most or all of the enemy team will have a -28 to all stats. Of course, you can be the lame lemon you are and use a smoke dagger, or you can go high investment with this build. THIS IS JUST A THEME BUILD. I use NY Takumi as a mage killer, most notably for Green mages. Darting Blow and a speed refine give Takumi plenty of speed for ensuring that he doubles more often than not. Swift Sparrow is probably a better choice but I don't have anyone with it to fodder. Cancel Affinity 3 assures a strong matchup against all mages, including Raven tome users like Cecilia. However, Blue Tomebreaker 3 or Green Tomebreaker 3 also work thanks to ensuring the double while also reducing damage taken. It's really just a matter of personal choice. The C-Skill is extremely flexible, and can be adjusted based on the team. If you really wanted, you could probably run Defense Ploy, since NY Takumi has enough Res to be able to debuff many common tank and infantry units. His weapon is +SPD. Deals 14 damage and def/res -7 on enemies whenever he attacks; great for armour teams that you want to whittle down. Solid res and high spd make him good for dealing with mages on the team as well. Kagami MochiAccelerates Special trigger (cooldown count-1). After combat, if unit attacked, inflicts Def/Res-7 on target and foes within 2 spaces of target through their next actions. Kagami Mochi+Accelerates Special trigger (cooldown count-1). After combat, if unit attacked, inflicts Def/Res-7 on target and foes within 2 spaces through their next actions. MoonbowResolve combat as if foe suffered Def/Res-30%. Atk/Res Bond 1Grants Atk/Res+3 to this unit during combat if unit is adjacent to an ally. Atk/Res Bond 2Grants Atk/Res+4 to this unit during combat if unit is adjacent to an ally. Atk/Res Bond 3Grants Atk/Res+5 to this unit during combat if unit is adjacent to an ally.